Ever notice how similar a lot of the "English" alphabet's characters look? The guy who put this together must have really phoned it in that day. but then he needed to come up with 10 more numbers... well none of those are unique! Iowa played Michigan State last night in East Lansing, Michigan. I am not a sports writer, so I will not attempt it here, but it was one of the best games of football that I have ever watched. 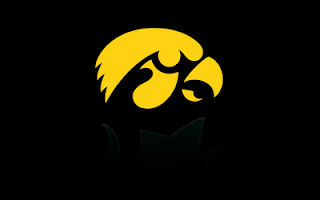 A total of three field goals through three quarters of play, two goal line stands from under five yards out, and a last minute drive from behind by the Hawkeyes. There were records broken on both sides. All through the game they fought.